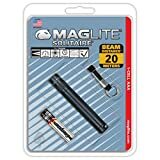 I bought a MagLite solitaire and a 2 D-cell (both black) for my dorm room in college, last september. Both flashlights are running on the original batteries, although the D-cell has seen more use and needs a change :-D This flashlight is wonderful for the price, bright, waterproof and tougher than heck! The anodized aluminum body resists chipping and rust.. which is your humble reviewer's only gripe. The small size of the flashlight may tempt a user to put it in his mouth for hands-free operation. While this works wonderfully (though may taste a bit odd) I would recommend putting a piece of tubing over the body of the flashlight to prevent wearing down or chipping the teeth. My only other advice is, you get what you pay for in batteries too, so feed your maglite good ones and you will see the difference. Beyond that I'd say this light is just about perfect in terms of small flashlights. 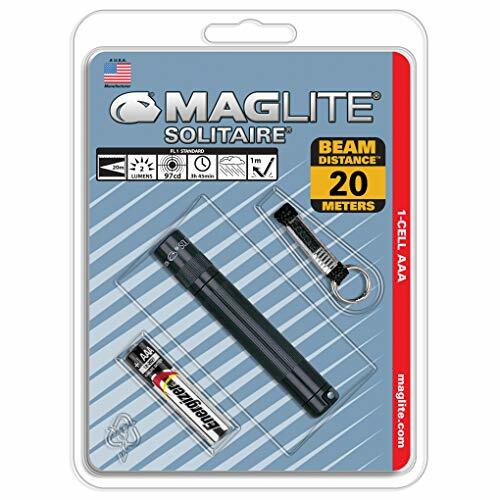 The Mag Solitare is definitely a recommendation for a present to anyone, especially loved ones who need a handy little light for any reason (from finding keys to somehow ending up in the forest behind their house looking for Fizgig the lost family cat and didn't bring a regular flashlight but have their keychain on them). It's a bright sucker and has a spot to flood beam. For a small flashlight, that's a generous feature. It comes with a spare bulb in the cap (nice) and a carrying strap / loop for your keychain (of course). It also comes in, I believe five shades too. Now...for the annoying parts. I had to replace at least two due to this fact: the battery compartment hopper is the part of the light that's attatched to the keychain. It's so easy to unwind and open, that after all that jiggling your keychain does, it comes off very soon. Sometimes I'd remember to check it, and sometimes, I'd be left with just the cap and no light in sight. Also, this light is a battery thirsty little devil. After a good half hour of on/off use here and there, that little light becomes a pale friend. Terrific. So, that said, is this light recommended? Yes-if you have a fresh new extra battery on you (in the car, or your purses...ladies), and if you check the battery knob every few days and tighten it regularily. Mean it. Take care of your Solitare, or it's lights out. If you buy, hope like hell yours doesn't break! 3 weeks ago, I contacted Maglite for a replacement switch for my 4-D flashlight, in which the switch failed. The customer service rep asked me for my serial number, which I gave her and she assured me that I could get a replacement switch. I gave her my name and address and she said that a shipment had just gone out, and it would be in the next shipment. That was fine with me. Days turned into weeks. Still no part. More days went by. STILL no part in the mail. Hmmmm. Is this how long time customers are treated? I previous owned a variety of their flashlights, from an AAA Solitaire to a 5-D flashlight, at least 5 in total. My dad has purchased in the neighborhood of 15 or more himself, starting in about '86 when someone else turned him onto Maglites. Customer support is as important to me as the product itself. Has customer support become a casualty of a tough economy? This long-time customer will have to look at alternatives the next time he's buying a flashlight. The Solitaire is relatively well built, but the poor beam makes it useless. Its not bright even with fresh batteries, and it QUICKLY dims. There is almost no sidespill, even when adjusted to wide beam. It eats up batteries, and has very poor beam quality. This is the only Maglite model that I rate as below satisfactory. It flat out fails. There are better options out there. Arc flashlights are very bright for their size, reliable, and have a good beam. They use LED bulbs that never burn out. Plus, they are semi-regulated so that they maintain their brightness for longer periods than the Solitaire. Other pocket lights worth looking at are Photon Microlights and the CMG Sonic (both use LED bulbs). Shop around, decide what works best for you and is in your price range. That said, I cannot recommend the Mag Solitaire regardless of price. Its poor beam and dim output make it all but useless. Deluxe brown leather belt sheath. 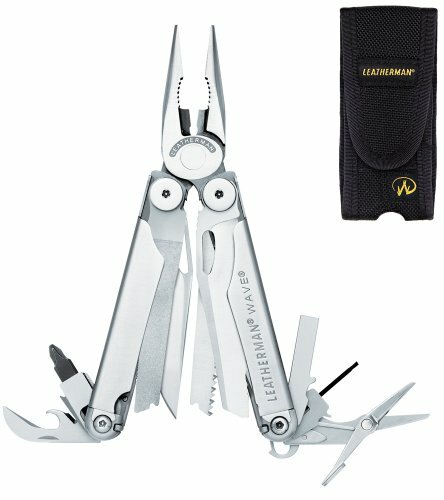 Leatherman has apparently changed the design of the deluxe Wave sheath recently. The older ones are as pictured in the Amazon pic above, with nice quality, finished leather and the word "WAVE" horizontally across the flap. The new ones are much cheaper feeling, and appear to be oil tanned instead of finished top grain. They simply have "Leatherman" diagonally across the front. Not as nice a sheath on any level. Still, they're a good 25% narrower than the nylon version, and Amazon has them priced right. I bought this item 2 Christmas's ago for my boyfriend. He always carried around a small pocket one and with his work in electronics he always found it useful to have it with him. I cn say 2 years later he still wears this on his belt everyday wherever he goes. It is used several times daily and has been a great purchase. It works today and looks just as good as the day he got it. I highly recommend this product as the most useful gift a guy could ever get! I got this sheath to replace one I lost. At first I considered going with the canvas sheath, but it was just so much larger than the leather sheath. I'm very happy with this item. A very useful sheath...better than the nylon and velcro. The Wave's leather sheath keeps the shape of the tool even when empty, so it is far easier to replace the Wave with one hand than it is with the nylon sheath, which is basically a nylon pocket you squeeze the tool into. The snap, however, requires a little too much force and needs to be aligned closely to easily snap together (the nylon's velcro, obviously, connects rather effortlessly). This isn't too big of a deal, since it's easy to line up the snap once the tool is in there anyway. I bought my original Leatherman tool 15 years ago, and it's served me well. 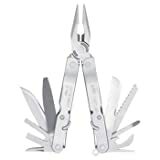 Since then, as one of my quests in life is for the ultimate multitool, I've bought at least a couple of dozen other multitools by various makers, most of which I don't even use since I still prefer my trusty old Leatherman most of the time. But when I saw a good price on this one, I jumped at it. I figured what the hell, you can't have too many tools in your life that you don't use, so I bought it. 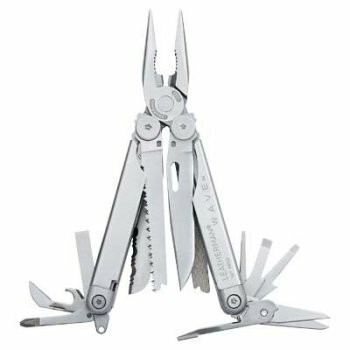 But I'm happy to say this is probably my favorite multitool, as far as ease of use, versatility, and overal design and qualty of construction is concerned, such as the convenient one-handed opening on the blades. 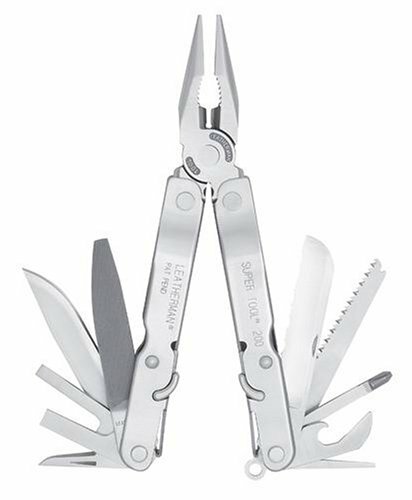 Since then Tim Leatherman has come out with the Leatherman Flair and the Crunch, or locking plier, but I think I prefer this one to those too. 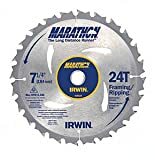 I also have his Supertool, which is great, although a little bit too big to carry all the time, but those big regular and serrated blades are pretty impressive. But I think the Wave edges out even the Supertool. So overall, a great tool and well worth the price. As a photographer, I wanted a smallish multi-tool to carry in my camera bag that would help me out with those little equipment failures and creative gerry-rigging in the field. I looked at Swiss Army, Spyderco, Gerber, and Leatherman multi-tools before choosing the Wave. I chose it because it has the largest number of tools that would be useful to me. And I've been happy with my choice. The Wave has four tools that you can access without opening the entire tool. These four tools lock, as well: a serrated blade, a file, a straight blade, and a saw. These blades are about 2 3/4 inches long and are easy to pull out. These additional tools can be accessed only when the Wave is open: a bottle opener, a phillips screwdriver, four sizes of flat screwdrivers, a lanyard hole, and scissors. These tools can be difficult to pull out. I frequently have to pull out a bunch of them and stuff the ones I don't want back in. The scissors will cut paper and cardboard easily, if slowly. These tools don't lock, but they stay in place pretty well. The pliers open 1 1/2 inches wide. The wire cutter works decently. I've used sharper, but these cut wire in a few tries if not on the first try. 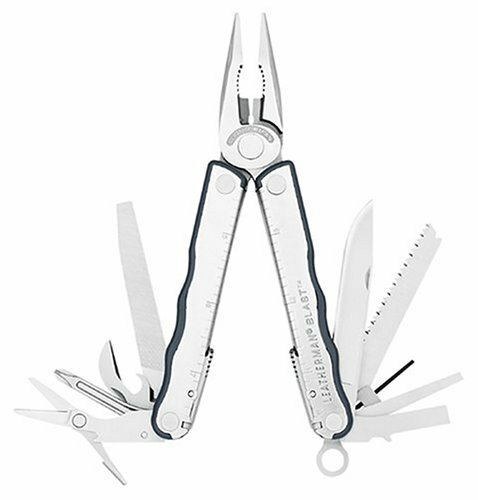 The Leatherman Wave is 6 1/4 inches long when open and 4 inches long when closed. It is reasonably comfortable to use although I think my hands would ache if I had to use it for a long time. All in all, the Wave is compact, useful and an excellent addition to the gadget bag of any photographer. If you need a really sharp knife, I have a Spyderco that is much sharper. For heavy duty work that requires a lot of torque, you'll need real screwdrivers. Jacks-of-all-trades are masters of none, as they say. But for light work and emergencies in the field, the Wave fills the bill quite nicely. 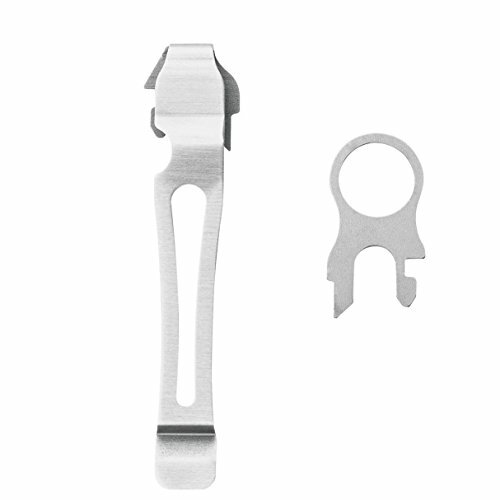 If you have equipment that requires an allen wrench or hex tips, consider getting the Tool Adapter for the Wave also. 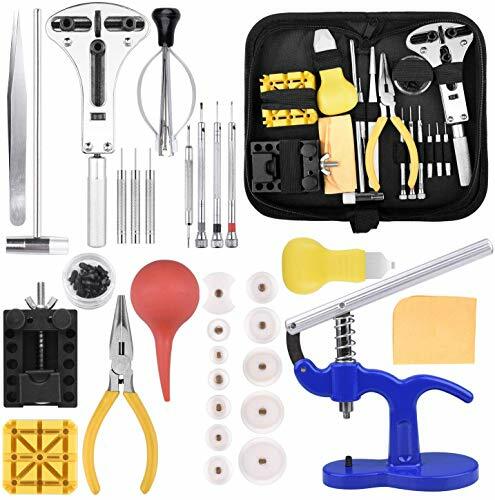 This 1000+ tool doesn't really do much because it weighs 10 lbs and is rather awkward, most of the tools are difficult to pull out and you need instructions because they are so compact and held together by a balstan ring which makes it hard to turn at angles. I took this with me to the mountain ranges of Oslo and threw it away because it was so terrible to carry around. I like tools! My problem is- usually they are where I am not! However- The 'Wave'- Hanging on my belt at all times- it is there and- it is indispensible! Just worked my cabin over in Alaska- used that little tool constantly- Even cut out the 'Moon' on my Outhouse door-with it! 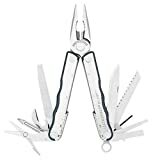 If you need one tool-to pack-and of the highest quality and versatility- The Leatherman Wave is it! The hit the nail on the head with this one - super tool. I use it in concert with a smaller Leatherman when two tools are required, e.g., a screwdriver and plyers. 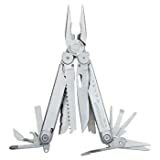 Buy a smaller Leatherman for lighter duty task, but take grab this for jobs that are less convenience and more tool oriented, e.g., camping, remodeling, etc. 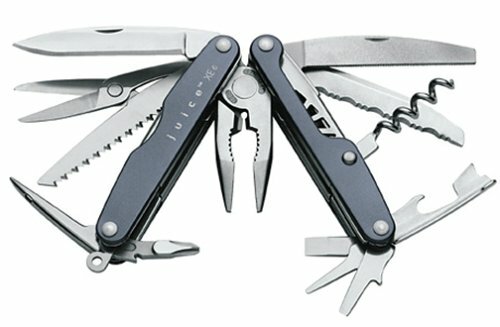 I own a Leatherman supertool, and it has served me faithfully for a long time. 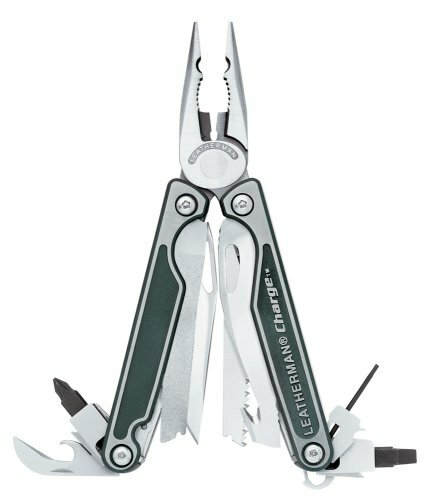 When Leatherman came out with the "200" I knew instantly that I had to upgrade, and I haven't been disappointed. The curled edges and lock releases were perfect additions to a nearly perfect tool. Obviously, a multi-tool is no replacement for a well stocked tool box. Be especially careful with electrical work. I was removing a Battery from a truck and accidentally touched the terminal screw and the frame at the same time. The arc ruined the tip of the medium flat tip screwdriver. Of all the multi-tools I've tried though, this is the best one hands down, and for what it is, nothing compares. 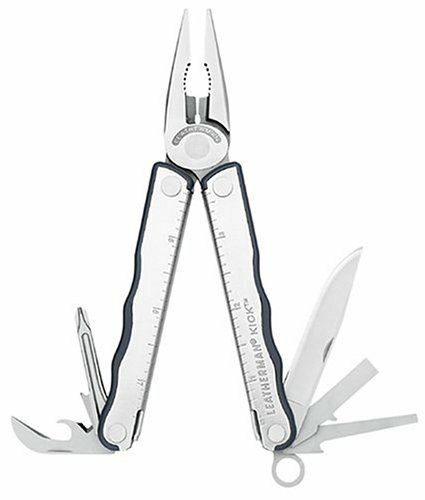 If every company produced products like Leatherman and backed their products like Leatherman, the world would be a better place. I use my Supertool every day and feel lost without it. It's like a comprehensive tool kit in one small and sturdy package. Even if I forget every other tool I need for a job, I usually can still manage if I have my Supertool with me. Thanks Leatherman for making something actually worth every penny I paid... times 1,000! This is a real man's multi-tool. 1) Will beat-up any of the other multi's in a street fight. 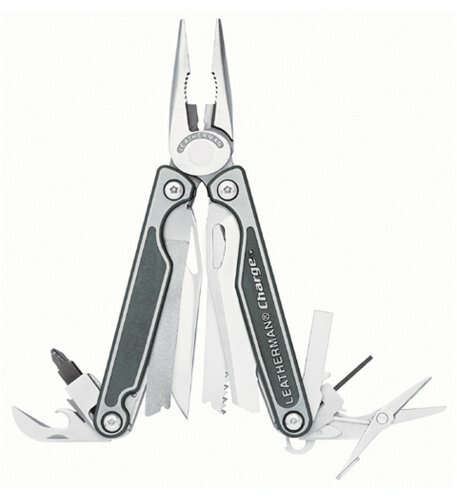 2) The Best file on any multitool ever made. One side is rough-cut and the other side is an even rougher cross-cut! Leave the wimpy diamond files found on other leathermans for fish hooks. 3) This thing can even be used as a hammer if need be. Nothing is going to snap off. 1) Why include a mini screwdriver? 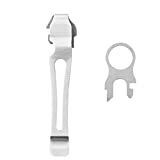 Many Leatherman reviewers have said that this item is easily bent. 2) When pulling one tool open, they all come out to say hello. 3) You need to open the pliers to get to the tools. 4) The worst part of a brand new tool is that the locking mechanism is TIGHT. Watch your fingers when trying to pull open and close the short sharp-edged tools. This many tools could never fit in your pocket? 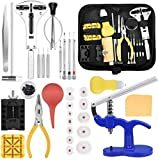 This guy is dead wrong, its much much higher for wave tool that doesn't even come with a leather pouch and couple bucks higher for the tool adapter. Personally, I wouldn't go the route of this tool as the wave does everything I need it to do in data networks and minor repair uses. My boss and I use our wave pretty much daily and I recommend it to all my cisco classmates. This Tool Adapter for the Leatherman Wave comes with 6 hex tips and a black plastic case, 2 5/8x2 1/4x3/4 inches in size with a belt clip on the back, in which the adapter and tips fit snugly. The case is no bigger -and may indeed be smaller- than a screwdriver-type handle or ratchet wrench and tips. So if you already carry a Wave, the adapter might be the practical way to go if you use hex tips. It will accomodate all standard 1/4 inch hex tips. The tool adapter fits onto the top of the Wave when it is closed. The tip has 3 positions to choose from: straight, a 45 degree angle to the Wave, and a 90 degree angle (perpendicular) to the Wave. The adapter works fine for light work. I would hesitate to use it for a job that requires a lot of torque because the adapter is not super-secure in attaching to the Wave. On these occasions, I would use the adapter without attaching it to the Wave. In fact, the adapter can easily be used on its own, and that is actually preferable in many instances. If you need to get into a small space or have trouble reaching, attach it to the Wave.